Scancare does own and use 3 Nikon 5000ED professional slide scanners. As I experiences a couple of times a year problems and Nikon repair center charge me for wrong reasons, I managed to fix and maintain these scanners myself up to a great level.. This page is dedicated to the maintenance and repair that could be easily done on Nikon 5000ED scanners. I any case, if in doubt, please send your scanner to a Nikon repair center. Disclaimer: All repairs would be done at your own risk: I take no responsibility for any problems you could encounter working on your Nikon scanner. Problem 1: Error scanning in image/'Hardware problem' as seen on the pc : I encoutered this on my windows 7 pc when I scanned more than one film frame. One frame went always ok.: I solved this my installing the Nikon view after i installed the Nikon scan software. Also I checked the 'compaitilility for XP' within my scanner exe's properties. Problem 2: Hardware problem on scanner: The led would blink as an indication the scanner encoutered a hardware problem. Solution : It could be one of the following. A dirty sensor (see my pictures futher on) that is located in different spots within the scanner. Please test with the default module to verify the problem is causes from the scanner itself and not the sf210. Please see the pictures for inside info..
Before repairing: take your time to inspect how the scanner is build up and get familiar with the different parts ans movements. Do not disassemble any optical parts if not needed. There is no need for that when cleening the scanner! There is no short cut to inspect the botton sensor and ons has to disassemble the scanner. 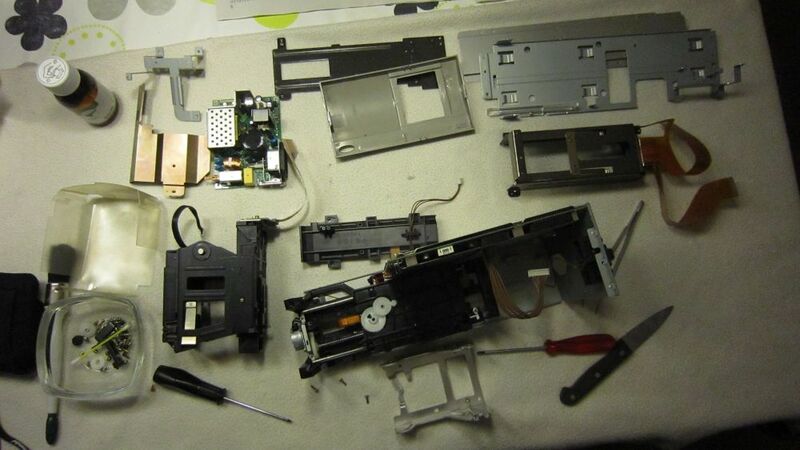 Inside the scanner : Step 1: open the scanners lid by removing all screws on outside.. Step 2 : locate all parts : if the problem is within the vertical lifting sensor, proceed by dismantling the rest : If done properly, no adjustments are lost. Remove power supply Remove brackets ons by one. Remove all cables from main board by lifting the smal bracket that holds the cable first. Remove the caridge by removing front plate and cardige back plate screws. Remove the cartridge holder. I cleaned first the arrowed pont and applied new vasiline as a lubrication. Old grease would prevent a smoothe vertical movement of caridge. Remove bottom bracket and clean the gear and the vertical movement sensor (see arrow in picture). This is the main cource of many problems as this sensor is obstructed by hardeded grease or dirt. Reasemble and lubricate all moving parts. (clean optical parts with a small cloth or compressed air (low pressure). Power failure. 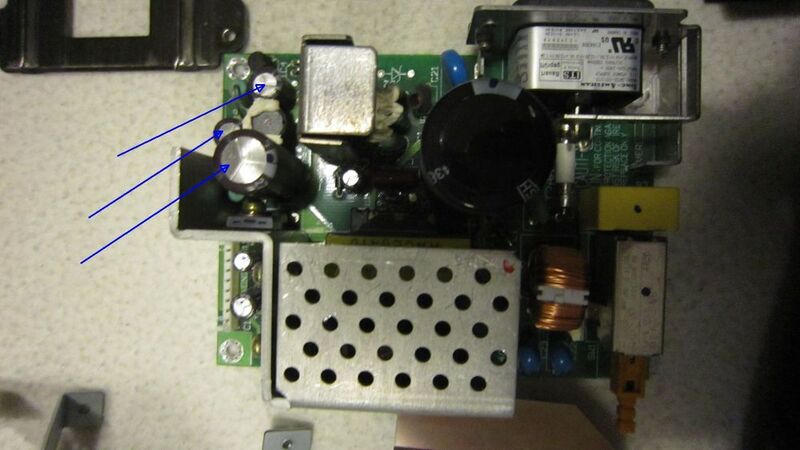 The Nikon scanners uses a regulated power supply, so it could fail without a warning. Most times it occurs the the scanner woul;d not power up after normal operation and swithed off. Please check the capcitors on the power supply board. Look for capasitors that are bubbled or have roundend top. this could indicate the faulty capasitor. Order them via ebay ans try to replace asking a friend... It cost me about 35c a piece. If on doubt, please send me an email. I will try to add additional information. I do have more pictures takn on the inside of the Nikon 5000ED slide scanner. If this page was of any help, be welcome to visit my sponsors.. If this page is of any help, you are welcome to let me know. 2012 : Maintanance and repair of the Nikon 5000ED scanner has been performed succesfully on all scanners in use!